Print and Kindle Versions Available Now on Amazon! This book is full of examples from my work that demonstrate some of the most useful things that you can do with Excel and how those things can make your work and personal life easier. Topics covered include formatting, writing formulas from simple to advanced, parsing text within your spreadsheet, financial calculations, and pivot tables. Every lesson within the book is example based allowing you to quickly apply the skills discussed to applications in your work. This text is intended for those who need to use Excel, but who are not experienced with writing formulas and manipulating data. It also has many details for those who have some understanding of how to write formulas, but want to expand their skills and make their work stand out. While the subjects covered are not incredibly difficult to grasp or apply, many are not well understood by even many experienced users. Learning the tools and tricks here will put you a step ahead of your co-workers in mastering most widely used data manipulation tool used in the world. 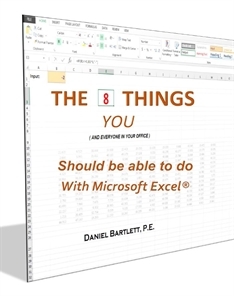 Download Excel files and extras for the "8 Things" book. 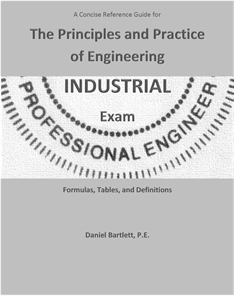 A Concise Reference Guide for The Principles and Practice of Engineering Industrial Exam is a collection of reference material to assist in the preparation for and taking of the PE Industrial exam. This book distills the very large body of knowledge that could be covered into what is most likely to be useful on the exam. The majority of the information was accumulated by the author prior to taking the exam with many subjects being added afterward to fill in shortcomings of the previous collection. Additionally beneficial is that fact that this resource is organized to be conducive to locating the needed information in the timeframe allowed by the exam, in contrast to many other general references on industrial engineering. This book will be an effective resource to utilize in completing practice problems prior to the exam and will allow the well prepared test taker to be successful. Included in the material are a wide variety of equations and relevant tables along with a glossary section containing explanations of hundreds of useful terms.